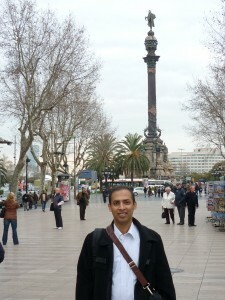 I went to Barcelona last week to attend the MWC (Mobile World Congress) 2010. This is the most prestigious event in the GSM world. All the wireless related companies stage their stalls here displaying their products and future aspirations. Leading personalities from the telecom industry address the audience. Every flight & every hotel in Barcelona was full. We stayed in an ordinary hotel, however charges per night were 270 Euros. This was the most expensive hotel I ever stayed in my life. 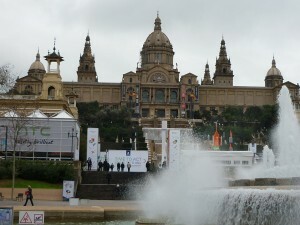 Weather is usually nice in Barcelona but was very cold this time. We were quite busy with customers representing our company during three days but I got the chance to explore Barcelona in the evenings as well as during the last whole day. It is a beautiful historic city. An interesting fact about Barcelona is, it has highest concentration of Pakistanis outside UK cities (& of course Pakistan). Nealry all from Gujrat, and 90% single. Spanish food is quite interesting. it contains a lot of fish, olive and cheese. 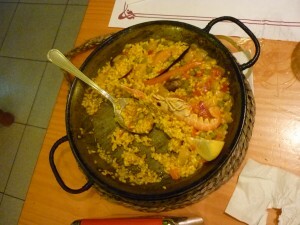 Paella is one famous dish made with rice and sea food in a round dish called paella. Rice were introduced in Spain by Moors (Muslims). The word paella came from Latin word Patela (also used in Italian as Padella & Punjabi as pateela) all meaning the same i.e. a pot. 400 million people speak Spanish as mother tongue making it the 2nd most spoken language. Spain is the third largest country in Europe in terms of area. Spain produces around 44% of the olive oil consumed globally. The capital City of Spain (Madrid) is the highest capital city in Europe. Madrid is 667 meters above sea level. 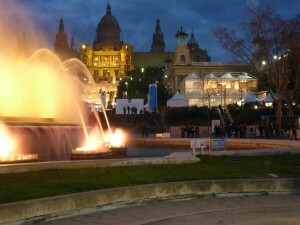 Madrid is also situated precisely in the centre of Spain. Spain is geographically the closest country to Africa: its province Andalucía (once Andalus, from where Muslims entered Spain) is merely 12 miles away from the coast of Morocco. Christopher Columbus started his journey to America from Spain with the help of Queen Isabella. Columbus arrived in America (in Bahamas, Cuba and Haiti area). He thought he had arrived in India so called locals Indians. Initially locals were happy to see him, unaware of the death he had brought to them. There is a company Qucomhaps based in Ireland who is interested in launching a whole wireless network from the air. They plan to install the radio & core on an airplane. There will be 4 or 5 airplanes flying in the air and covering the whole country. One airplane can take a load of 5000KG and can stay in air for about 5 hrs. – NTT DoCoMo had a strange eye-controlled MP3 player on display. The presenter was performing “play, pause, reverse, forward, volume control etc” with his eye movements. It was quite interesting. The way it works is, our eyes have positive current at the front and negative current at the back. As we move our eyes the electrical field moves and changes direction. This slight change is detected by the electrodes in each earphone. Which are then linked to a predefined command in the player. Such a device is expected in the market within a year or so. – My Laptop Got Stolen & Recovered: I was standing on the hotel reception. My laptop & luggage was lying on the sofa behind. There were only two people. Suddenly I noticed a man bending near the sofa and then rushing out. I got suspicious and quickly went behind him. Before he turns around the corner, I grabbed him. He was holding my laptop which he handed back to me promptly and ran away!